Escapes! to the Gulf Orange Beach Resort, formerly known as the Palm Beach Condominiums Resort, rests on one of the world’s most magnificent seashores. Miles of sugar white beaches meet the warm, blue Gulf waters, creating the most desirable seaside destination along the Alabama and Florida Panhandle coast. Leave the beach for a while, and you’ll find a number of attractions in Orange Beach and adjoining Gulf Shores. Theme parks, waterside restaurants, historic sites, signature golf courses, and shopping are among the activities that bring happy families back year-upon-year. Surround yourself in the luxury, comfort and sophistication of this timeless, Mediterranean-style resort. This quality resort features luxurious amenities, including two heated pools, full kitchen, and washer dryer in every condo. With direct beachfront access, a boardwalk connecting the resort’s courtyard and pool area to the sand and surf. You and your family can play, relax, unwind, rejuvenate… do it all at this five-star seaside resort on the incomparable Alabama Gulf Coast. 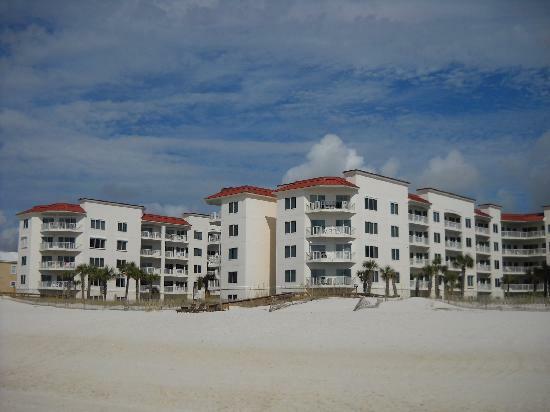 Escapes to the Gulf Orange Beach includes one, two and three bedroom lodging accommodations. The resort is gulf front, and all villas provide ocean, courtyard and pool views. No availability at this resort, please go here for something else. Experience the ultimate in luxury, comfort and convenience at Escapes to the Gulf Orange Beach Resort. All condominiums overlook the lush courtyard/pool area and many offer vistas of the beach and sparkling blue Gulf waters. We own prime mid-August Week 32, Unit D-23 (this is a second floor unit in the west building, not too far back from the beach end of the building, so it has very good views of the pool area, and east and south over the Gulf of Mexico). Save by renting through us! Compare at $1631 per week (rate for identical dates at Palm Beach Resort through booking.com). Whether lounging by the pools or relaxing surfside, you’ll find our gulf front location ideal for enjoying Alabama’s soft sandy beaches. A central courtyard with two pools opens to the Gulf, offering a perfect vantage point from which to decide on or to appreciate the beach activities. The courtyard, which is expertly landscaped with palm trees and other tropical plants, is linked to the beach by two boardwalks. The resort also offers 2 fitness rooms, complete with a Universal weight machine, bike and treadmill, and an activity room for social gatherings. Volleyball and badminton equipment are also available. Start planning your getaway to Gulf Shores and Orange Beach with this helpful site. See the calendar for up-to-date details on festivals, special events and more. Its always tee time on these world-class courses created by some the grand games most celebrated designers. Check out the two Arnold Palmer designed courses at Craft Farms. Catch a boat and enjoy all that the Gulf has to offer! Site of a Civil War navel battle where Admiral Farragut uttered the immortal words: Damn the torpedoes; full speed ahead! Living history programs, reenactments and candlelight tours make this a must see for history buffs. Reptile house, aviary and petting pens are some of fun activities at this zoo, which provides elevated viewing decks for exploring the natural habitats of more than 250 animals. Among the attractions here is an IMAX theater and over 140 beautifully restored aircraft. A viewing area is available to watch The Blue Angels practice (most Tuesday and Wednesday mornings). Museum is in Pensacola, FL, about 18 miles from the resort. Ride the Screamin Demon or catch the endless wave on the Flowrider. Part amusement park, part water park, this is one of the areas more popular attractions.